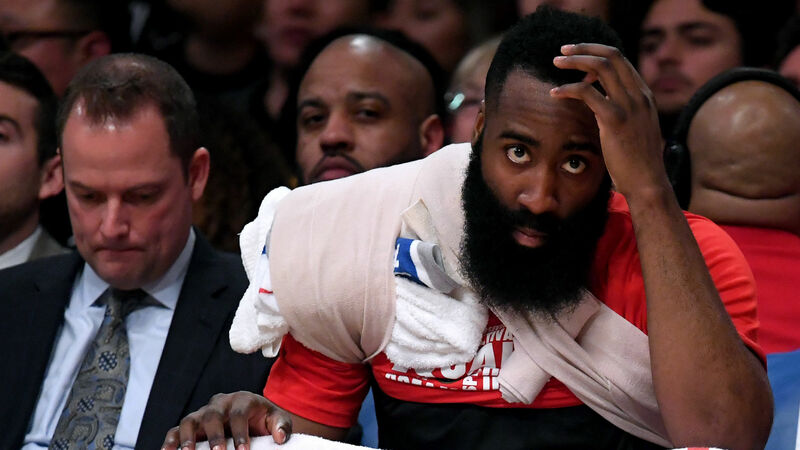 James Harden says "rude and arrogant" Scott Foster should never be allowed to officiate the Houston Rockets again after the reigning MVP and Chris Paul fouled out in a defeat to the Los Angeles Lakers. The Rockets went down 111-106 at Staples Center after they had led by 19 points midway through the third quarter on Thursday. Harden extended his 30-point streak to 32 consecutive games before fouling out with a minute and 24 seconds remaining, and Paul followed him when he was called for a technical foul by referee Foster with 33 seconds to play. A dejected Harden did not hold back with his criticism of Foster - who Paul complained about last season - after a third defeat in four for Houston. "Scott Foster, man. I never really talk about officiating or anything like that, but just rude and arrogant." said Harden. "You aren't able to talk to him throughout the course of the game and it's like, how do you build that relationship with officials? "And it's not even that call [on the sixth foul]. It's just who he is on that floor. It's pretty frustrating and I'm probably going to get hit [with a fine], but honestly, I don't really say anything. "I'm a pretty quiet guy, to myself, but it's one of those things where you can't voice your opinion. You can't have a conversation with someone that's officiating the game. You're getting a tech. It's pretty sad." Harden added: "It's lingering, and it's something that has to be looked at, for sure. For sure, it's personal. For sure. I don't think he should be able to even officiate our games anymore, honestly."